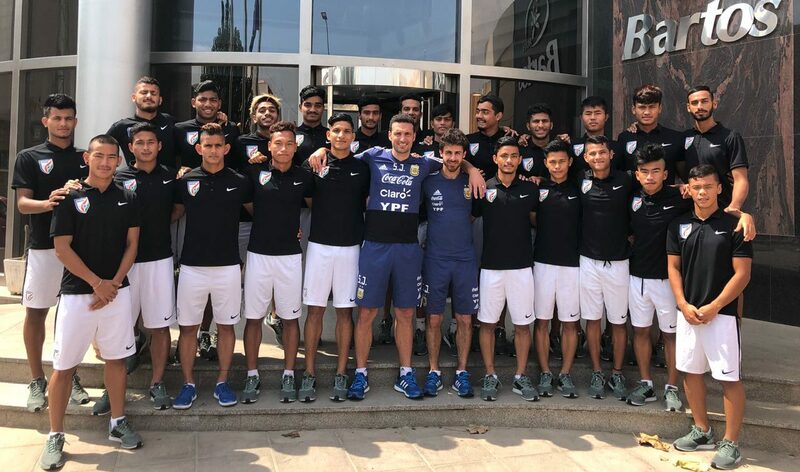 Days after India U-20 defeated Argentina U-20 in the COTIF Cup, former Argentine great Pablo Aimar, who accompanied the Argentina U-20 team as the Technical Director, lavished huge praise on the Indian colts. Both Aimar, and Coach Lionel Scaloni had dropped into the Indian Camp to have a chat with the Indian boys. “We would be happy and would like to play other Indian age groups teams as well. The U-20 Indian National Team players played well with a lot of passion and the players ran a lot during the matches” Aimar, regarded by many as one of the most elegant Argentine players after Diego Maradona, said. “We would be happy and would like to play matches against Indian National Teams in India or in Argentina in near future,” he opined. Lionel Scaloni, who coached Argentina U-20 in the COTIF Cup singled out Amarjit Singh and Jeakson Singh for their performances. “Indian Captain Amarjit Singh played very well against Argentina and Jeakson Singh was very impressive the manner he played against Murcia,” Scaloni, who has taken up as the Head Coach of the Argentina Senior National Team stated.